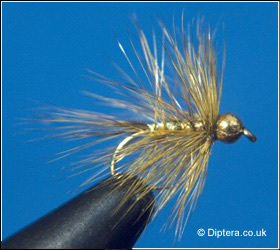 The Wickhams Spider also known as the Wingless Wickhams is one of my favourite flies. I have found the best time for this fly is spring to late summer. The palmered hackle can be grizzle, red game, olive, black or mixed, all five variants fish well. The fly is usually fished on an intermediate line on its own or part of a team of two or three flies. Anything from a slow figure of eight retrieve to a "fast as you can pull" can be used, different days need different methods of retrieve.